On May 18, in the press conference held at Okinawa Christian University in Nishihara, Kim Bok-don rebutted Hashimoto's remarks. Kim visited Okinawa from South Korea to speak for the “Exchange meeting with halmeoni (grandmother in Korean) to study the Imperial Japanese Army’s comfort women issues.” The executive committee and the Okinawa Christian Peace Studies Center co-hosted the meeting on May 18. 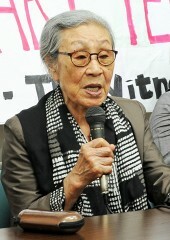 Kil-Whnok, 84, a former comfort woman attended a lecture presentation held in Fukuyama in Hiroshima Prefecture and criticized Hashimoto’s remarks. Kim will attend the meeting with Hashimoto on May 24.